While overall home sales in San Francisco slowed in September, buyer competition heated up for homes priced between $2 million and $3 million. Eighty-two percent of homes priced between $2 million and $3 million sold for more than asking price, with average premium at 19 percent. Despite the September sales decline, overall sales in 2017 are on par with the same period last year. San Francisco inventory is falling at one of the fastest rates in the Bay Area. The decline in the city is driven by a large drop-off in condominium sales, especially in Districts 5, 9, 1, and 7. Across all districts, sales of homes priced below $1 million fell by 9 percent, while sales priced between $1 million and $2 million increased by 6 percent; sales priced between $2 million and $3 million increased by 18 percent; and sales priced above $3 million increased by 15 percent. 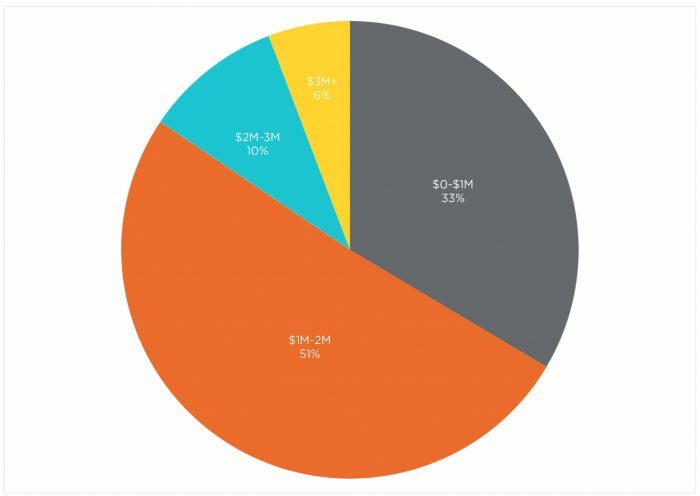 Fifty-one percent of San Francisco sales are priced between $1 million and $2 million. Districts 3 and 4 have the most competition among buyers, while Districts 1 and 7 saw the relatively highest increase in buyer competition from last year. Districts 7 and 5 have had the biggest gain in condominium sales this year. In September, sales of all homes in San Francisco fell by about 20 percent year over year. Slower September sales came after strong summer months that provided a slight pickup in activity over last year. Overall sales year to date in 2017 are only slightly higher — 1 percent — than for the same period last year. Generally, Bay Area housing markets have struggled to see annual increases in sales this year as inventories continue to decline, with San Francisco’s supply falling at one of the fastest rates in the region. This analysis offers more insight on September Bay Area housing market activity. Slower September activity in San Francisco was driven by a larger drop-off in condominium sales than single-family homes, with respective declines of 27 percent and 8 percent. In looking across the city, districts that led with relatively higher declines for all types of sales in September include District 5, District 9, District 1, and District 7. However, those are districts with a higher share of condo sales than single-family homes. Nevertheless, examining the entire year may better illustrate changes in activity across the city, since some districts have only a few monthly sales. 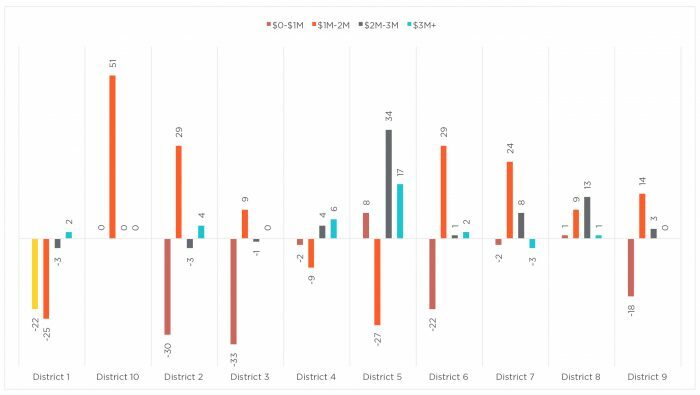 Figure 1 highlights the year-to-date change in sales by district, showing double-digit percent declines in Districts 1 and 3 and contrasting double-digit-percent increases in Districts 7 and 10. Districts 1 and 3 also suffered from large monthly declines in active inventory over the last year. On the other hand, District 10, which encompasses the South of Market and Mission Bay neighborhoods, has benefited from plenty of new construction over the last few years, while District 7 remains one of the most sought-after pockets of San Francisco. Source: Terradatum, Inc. from data provided by local MLSes, Oct. 6, 2017. Furthermore, as our previous analyses have shown, higher price ranges have performed relatively better over the last year, though variations by district still exist. Figure 2 illustrates changes in the number of homes sold year to date in each of the 10 San Francisco districts by price segment. What stands out is the falling number of sales below $1 million, which is expected given that the median home price in most districts exceeds the million-dollar mark (see Figure 1). Districts 2 and 3 saw the largest decline in sub-$1 million sales, with District 2 having an offset by sales of homes priced above $1 million and below $2 million. Again, keep in mind the relatively larger decline in active inventory levels in those districts as shown in Figure 1. Across all districts, sales of homes priced below $1 million fell by 9 percent year to date, while higher-priced segments saw overall increases in sales, with a 6 percent increase for homes between $1 million and $2 million, an 18 percent sales gain for homes between $2 million and $3 million, and a 15 percent sales gain for homes priced above $3 million. With the 9 percent sales decline for homes priced below $1 million, the relatively larger increases in higher-priced categories brought total 2017 home sales activity only 2 percent higher than last year. Figure 3 illustrates how sales break down by price segment. Homes priced below $1 million now comprise one-third of sales, down from 38 percent from last year. Most San Francisco sales are now for homes priced between $1 million and $2 million. However, over the last year, sales activity for homes priced between $2 million and $3 million increased at a relatively faster pace than homes in other price ranges, at an overall year-to-date rate of 18 percent. About 60 percent of the jump came from District 5, followed by another 20 percent from District 8. The spike in sales activity for homes in that price range was also accompanied by heightened buyer frenzy. In September, the largest share of homes that sold over the asking price were priced between $2 million and $3 million. Figure 4 summarizes buyer competition by price range. Overall, 82 percent of homes priced between $2 million and $3 million sold for more than asking price, which is a 14 percent increase from last September, when 68 percent of sales netted premiums. Buyers who closed deals on average paid 19 percent more than asking price. Again, that’s an 8 percent increase in premiums over last year, when winning buyers were paying an average of 11 percent premiums. 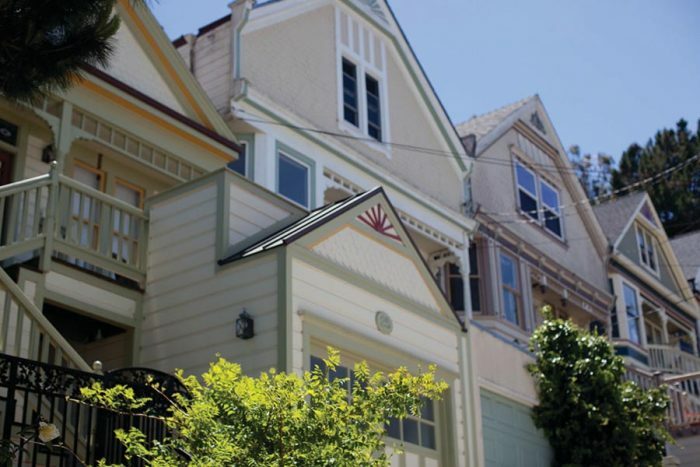 San Francisco Districts 3 and 4 have the most competition among buyers. All sales in District 3 sold for more than asking price. While District 3 remained competitive from the last year, District 4 saw more bidding wars this year, with an 18 percent increase in the share of homes selling over the asking price. In fact, Districts 1 and 7 saw the relatively highest increase in buyer competition, with respective 25 percent and 22 percent increases over the last year. On the other hand, District 8 lost a solid share of buyer competition, and with a 21 percent decline, the area saw only four in 10 homes selling over the asking price, and at the lowest premium in the city — 7 percent. Looking at San Francisco market dynamics, it appears that the rest of the year will remain highly competitive. Home shoppers are facing an ever-decreasing inventory of properties for sale and more competition for those few that are on the market. After last year’s lull in appreciation, the median sales prices year to date is up 5 percent from last year. Districts 3 and 1 saw the largest gains, a respective 19 percent and 13 percent. In September alone, San Francisco’s median price increased by 12 percent on an annual basis. While overall year-to-date condominium sales inched up by 1 percent, sales in districts with predominantly condominium housing, including Districts 6 through 9, increased by 4 percent. The 15 percent year-to-date increase in District 7 led the gain, followed by a 7 percent increase in District 5. Districts 9 and 10, where the majority of new condominium construction has occurred recently, saw sales remain relatively flat compared with last year. In districts such as 1 and 3, with relatively lower shares of condominium housing, sales of condos fell year to date by 30 percent on average. At the same time, inventories in the districts with lower shares of condominiums have also been falling notably over the last year, with an average 40 percent year-over-year decline. On the other hand, District 7, which had the largest gain in condominium sales over the last year, saw an average 15 percent annual increase in inventory. District 7, however, accounts for only 7 percent of September’s supply of condominiums. Citywide, existing condominium inventory has been declining since March of this year, with an average monthly decrease of 14 percent. Similarly, according to data collected by The Mark Company, inventory of newly constructed condominiums has shown an even greater decline over the last year six months, averaging 28 percent each month. Figure 6 illustrates monthly inventory of new and existing condominiums in San Francisco, highlighting that after last year’s peak in September, available inventory has been dropping. Analyzing district MLS data, which does not include all newly constructed condos, inventory fell in most districts in September, except in Districts 4 and 10, where supply conditions improved slightly year over year. However, with relatively few condominiums in those districts, the increase amounts to only three units. District 9, which contains 40 percent of San Francisco’s for-sale condo inventory, saw available units decline by 42. Figure 7 summarizes year-to-date changes in active inventory and corresponding percent changes, median condominium prices in September, and year-to-date median price changes. The reason for including year-to-date median price changes instead of annual changes is because of very few, if any, condominium sales in some districts. For example, there were no condominium sales in District 3 in September. Nevertheless, changes in inventory range widely, as does the change in median condominium prices. District 3, which again does not contain many condominiums, saw the median price fall. On the other hand, Districts 6 through 9 saw median price changes ranging from 0 percent to an increase of 12 percent. And price changes are not necessarily correlated with changes in inventory. In District 8, for example, inventory increased by 10 percent, while prices rose by 4 percent. Nevertheless, the lack of supply does drive price increases in general. Districts 1, 6, and 7, with the largest declines in inventory also saw the relatively largest median price increases. These districts, however, remain highly desirable, and as their median prices suggest, they are some of the highest-priced neighborhoods in San Francisco. Again, fewer transactions in some districts can make measuring median condominium prices a tricky business, Figure 8 illustrates citywide price trends for newly constructed units and existing or resale units. Trends suggest that while pricing for newly constructed condominiums declined some since the peak in summer of 2015, existing units continued to gain value in price per square foot. Keep in mind that The Mark Company’s new condominium pricing index is benchmarked on the price of a new, 10th floor, 1,000-square-foot condominium. Source: The Mark Company Trend Sheet, September 2017. 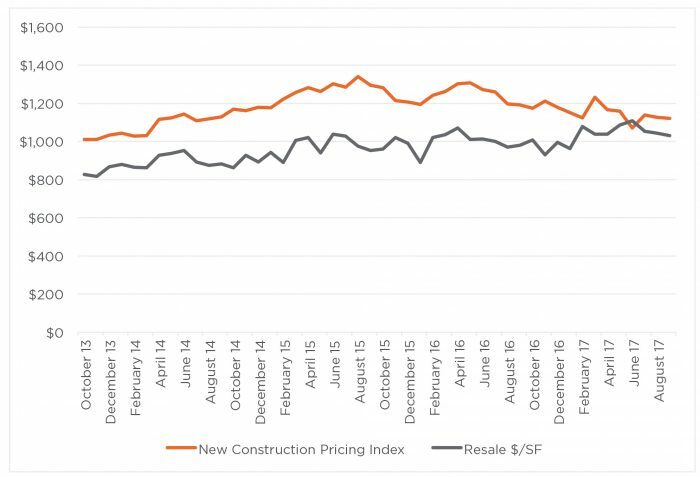 The Mark Company Pricing Index is the tool for tracking the value of a new- construction condominium without the volatility of inventory changes. The Pricing Index uses a proprietary quantitative method to model the price per square foot of a new, 10th-floor, 1,000-square-foot condominium. Moving forward, despite what have may seemed like a flood of new construction hitting the market, supply conditions remain tight in San Francisco, making the city unaffordable for many of its residents. Demand remains consistent for existing condominiums, which is partly due to their location in desirable neighborhoods but also to relatively lower prices per square foot. For new condominiums, while price trends have slowed some, it is not clear that the decline in the pricing index will persist, especially given the narrowing price differential between new and existing condominiums. But buyers may remain hesitant following the challenges around the Millennium Tower. Another factor that will impact the city’s housing market is potential influx of Wine Country residents who have lost their homes in recent wildfires and may choose to move to San Francisco. Marin County has already seen some Wine Country residents looking for homes there.